The BC Centre on Substance Use (BCCSU), in collaboration with the BC Ministry of Health, has released a new Guideline for the Clinical Management of Opioid Use Disorder. Effective June 5, 2017, this guideline is the provincial reference tool for all health care professionals in BC involved in treating patients with opioid use disorders. This is the second in a series of three guest posts from the BCCSU about the provincial guideline. 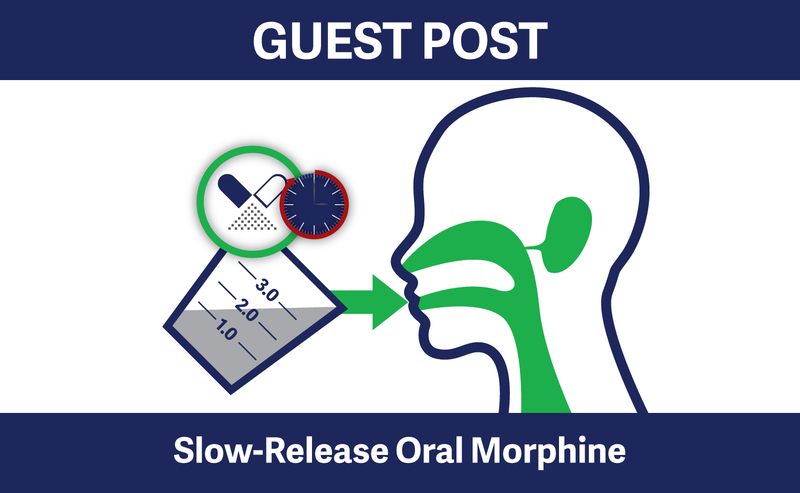 Guideline Recommendation - Slow-Release Oral Morphine: Opioid agonist treatment (OAT) with slow-release oral morphine (24-hour formulation, brand name Kadian®) – prescribed as once-daily witnessed doses – may be considered for patients who have not benefited from treatment with first- and second-line treatment options (i.e., buprenorphine/naloxone and methadone). Kadian® slow-release oral morphine is available in 10mg, 20mg, 50mg, and 100mg capsules, which may be combined as necessary to achieve prescribed doses. Kadian® slow-release oral morphine is a once-daily, 24-hour formulation. Other formulations of oral morphine that are used for analgesia, such as twice-daily, 12-hour sustained- or extended-release formulations (M-Eslon®), are not recommended for OAT. As of June 5, 2017 – BC PharmaCare provides coverage of slow-release oral morphine (Kadian®) as an OAT medication for the treatment of opioid use disorder under Fair PharmaCare, and Plans P, C, B and G. Both the drug cost and a dispensing fee are covered up to PharmaCare maximums. Coverage under Fair PharmaCare may be subject to deductibles and family maximums. Slow-release oral morphine for OAT is approved by Health Canada for full coverage through the Non-Insured Health Benefits (NIHB) Program as a limited use medication for the treatment of opioid use disorder up to a maximum dose of 400mg/day (with coverage for doses exceeding 400mg considered on a case-by-case basis). Both the drug cost and a dispensing fee are covered up to regional maximums. New Product Identification Numbers (PINs)– Effective June 5, 2017, PharmaCare established new Product Identification Numbers (PINs) for the use of Kadian® slow-release oral morphine as OAT. These PINs must be used when submitting claims for the various dosing strengths through PharmaNet. Similar to methadone, the current Drug Identification Numbers (DINs) will be used by pharmacists exclusively for claims for analgesia, and the new PINs will be used for claims for OAT. Prescriptions for Kadian® should specify whether it is designated for analgesia or OAT (i.e., “for OAT” or “for opioid agonist treatment” must be indicated on the prescription). If there is a question as to whether the prescription is for OAT (i.e., indicated by the dose strength, directions to “open and sprinkle” capsules for daily witnessed ingestion, or other elements of the prescription), but the prescription lacks the explicit indication “for OAT”, the pharmacist should contact the prescriber to confirm the intended use prior to dispensing the medication and properly document any alteration of the prescription. The claim entered into PharmaNet must match the prescription written by the prescriber. If a claim marked “for OAT” has been entered under the DIN rather than under the new PIN for Kadian® for OAT, it must be reversed, following the full standard procedure for reversing a claim entered under the wrong DIN or PIN. Only after a claim has been reversed can it then be re-entered with the correct PIN. Drug interactions – PharmaNet’s Drug Evaluation feature automatically checks for drug interactions upon entry of a DIN, but is not activated by entry of a PIN. Similar to methadone for OAT, PharmaNet will not automatically check for drug interactions upon entering a PIN for Kadian® for OAT. Therefore, it is important to review common potential drug interactions with slow-release oral morphine (Kadian®) on PharmaNet and with the patient prior to each dispensation. These include CNS depressants, muscle relaxants, mixed agonist or antagonist opioid analgesics, MAOIs, cimetidine, and diuretics. Ask the patient about their use of alcohol and/or benzodiazepines and remind the patient that co-ingestion of slow-release oral morphine (Kadian®) with alcohol or benzodiazepines is contraindicated, as combined effects can potentially result in fatal respiratory depression. The PINs in the following table must be used when entering Kadian® for OAT prescriptions into PharmaNet. DINs for corresponding doses of Kadian® for analgesia/pain are also provided for reference. How might these changes impact my pharmacy practice? You may see an increased volume of prescriptions for slow-release oral morphine (Kadian®) for OAT in your practice. Due to the risks and diversion potential associated with this medication, careful monitoring during dispensation and daily witnessing of slow-release oral morphine, in addition to patient education, support and guidance, are particularly vital to promote patient safety and treatment success. Additionally, due to PharmaNet’s inability to auto-track drug interactions with PINs, it is important to review common potential drug interactions with slow-release oral morphine (Kadian®) on PharmaNet and with the patient at each visit. Slow-release oral morphine has a high risk of diversion, even when administered as witnessed doses (e.g., intact capsules can be ‘cheeked’ or ‘palmed’). To reduce this risk, open the capsule and sprinkle pellets into a medicine cup or onto a soft food (e.g., applesauce, jam) for witnessed ingestion. In settings where a soft food is not available or patient allergies are a concern, pellets may be sprinkled into a 30mL medicine cup or small cup and swallowed followed by at least 30mL of water to ensure that all pellets have been swallowed. Important Safety Notice: Slow-release oral morphine pellets must be swallowed whole. Crushing, chewing, or dissolving slow-release oral morphine pellets can cause rapid release and absorption of a potentially fatal dose of morphine sulphate. Advise patients to talk to their prescriber about any continuing withdrawal symptoms, craving, and/or non-medical opioid use. If any clarification is required on dosing or dispensing requirements for witnessed ingestion of slow-release oral morphine, call and discuss with the patient’s prescribing physician and properly document any alterations of the prescription. The majority of prescriptions for slow-release oral morphine will be for daily witnessed ingestion (DWI). In exceptional cases, patients may be transitioned to take-home dosing schedules. If a patient’s prescription indicates transition to a take-home dosing schedule for slow-release oral morphine, it is best practice to call and confirm with the prescribing physician. The first dose of slow-release oral morphine on a prescription for take-home dosing must always be witnessed in the pharmacy on the day the prescription is picked up. This should be indicated on the prescription. Compliance packaging (i.e., blister packs) is highly recommended for all take-home prescriptions to optimize patient safety, reduce risk of diversion and allow for better monitoring during random medication callbacks. This should be indicated on the prescription; if not indicated and you have concerns about potential diversion, you may wish to confirm with the prescriber. For patients receiving take-home doses of any opioid agonist medication, discuss safe at-home medication storage and provide advice as needed. Notify the prescriber of any missed doses. It is our recommendation that pharmacists connect with the prescriber by phone, or complete and fax a missed dose report to the prescriber. No change in dose may be required if one day is missed, but the missed dose must be documented and discussed with the patient. If two or more consecutive days are missed, dose adjustment may be required. Prescribers should let pharmacies know in advance of their clinic policy for missed doses; if not provided, you may wish to contact the prescriber for this information. Stay tuned for an upcoming Guest Post on the new Provincial Opioid Addiction Treatment Program launching July 2017. As of June this program has replaced the provincial methadone program through the College of Physicians and Surgeons of British Columbia and has been expanded to include the full range of medications used to treat opioid addiction (i.e., buprenorphine/naloxone, methadone, and slow-release oral morphine). The new online learning platform will serve to improve accessibility to high-quality education for the clinical management of opioid use disorder. Subscribe to the BC Centre on Substance Use mailing list or follow us on Facebook or Twitter for updates on clinical practice standards and guidelines, upcoming events, and online interdisciplinary education and training programs. Jessica is a Student Research Assistant with the BC Centre on Substance Use (BCCSU) and a B.Sc. candidate in Integrated Sciences at the University of British Columbia. Her research interests include factors in adherence to antiretroviral therapy for individuals with HIV, and innovation in the treatment of opioid use disorder in correctional settings. In her role at the BCCSU, Jessica additionally works with the BC Node of the Canadian Research Initiative in Substance Misuse (CRISM) on clinical trial and community based research in partnership with drug user groups in Vancouver’s Downtown Eastside. Cheyenne Johnson is the Director of Clinical Activities and Development with the BC Centre on Substance Use and the Director of the BC Center on Substance Use Addiction Nursing Fellowship. In her current position she oversees the development of provincial clinical care guidance documents and dissemination, including evidence-based clinical guidelines, practice support tools and policy briefs. Cheyenne completed her Bachelor of Nursing Science at Queen’s University and her Master’s of Public Health at Simon Fraser University. She joined the BC Centre for Excellence in HIV/AIDS in 2013 as a Clinical Research Nurse, where she went on to be the Inaugural Nursing Fellow of Canada’s only addiction nursing training program, the St. Paul’s Goldcorp Addiction Nursing Fellowship. Emily Wagner, MSc, is a Medical Writer at the BC Center on Substance Use. She worked closely with the guideline committee and chairs to develop the BCCSU Guideline for the Clinical Management of Opioid Use Disorder. Emily completed her Master’s of Science at Simon Fraser University. Prior to joining the BCCSU in 2015, she worked as a Research Manager at BC Women's Hospital and Health Centre for seven years in the field of reproductive infectious diseases.